Looking for cheap British Airways flights? Search, compare and book the most affordable flights on South Africa Travel Online by completing the booking form on the left. Find more information on British Airways international below. It is important to note that there are two British Airways! This page provides information on British Airways PLC which is based in the UK and operates direct flights from South Africa to London and beyond. British Airways operated by Comair operates domestic and regional flights from South Africa. British Aiways has been named one of the World's Best Airlines at the 2015 World Airline Awards! They also boast a 4 star rating with Skytrax. From South Africa they offer direct flights from Cape Town and Johannesburg to London Heathrow and Gatwick airports (Nov 2016) and beyond. Currently they are the only airline to offer direct flights to London from Cape Town. Use the flight bookings tool on the left to find the cheapest flight to London and then use SouthAfrica.TO flight discount vouchers to reduce your airfare more (if you've got no vouchers then start earning them with your BA flight to London - simply email us a review of your flight and we'll send you some vouchers). 22 October 2018: British Airways experienced a massive data breach, first reported on in September 2018. The data breach affected passenger's credit card details that were entered on their website or mobile app between 21 August and 5 September 2018. Affected passengers were contacted by the airline and likely had to cancell their credit card afterwards. The online theft saw details stolen including name, email address and credit card information, including the CVV code. 24 May 2018: British Airways are adding four more flights per week to their Johannesburg - London route from the 28th of October 2018. They will also increase their Cape Town - Heathrow flights from daily to double daily for the upcoming summer and will add three flights per week to their Cape Town - Gatwick route. 23 May 2018: From the 29th of October 2018 British Airways will operate direct flights between Durban and London Heathrow. They will operate three weekly flights. Flights from Durban will depart on Tuesdays, Fridays and Sundays and return flights from London will depart on Mondays, Thursdays and Saturdays. British Airways offers direct flights from all major international airports in South Africa to London Heathrow and London Gatwick airports. Travellers can choose to either fly directly between South Africa and London or connect via London to destinations in the UK, Europe and the USA among others. All travellers 2 years + are allowed one handbag/laptop, one cabin bag and at least one checked bag. Infants under the age of 2 are only allowed one cabin bag. Both the airline and the respective airports can regulate handluggage allowances. If you are travelling from South Africa, the ACSA rules also apply. 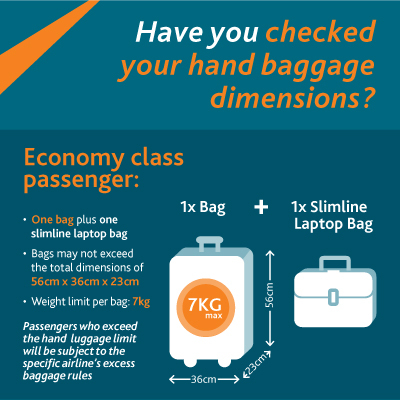 Below you'll find the strictest of the two rules to make sure you don't have to check your hand luggage in at OR Tambo. Handbags and laptop bags can be no bigger than 40cm x 30cm x 15cm and weigh a maximum of 7 kg. Your additional cabin bag can be no bigger than 56cm x 45cm x 25cm and weigh a maximum of 7 kg. Quick tip: If you have already made a booking on British Airways you can log in online using the reference and check the exact allowance allocated to you. This is where you'll find the most up to date information as airlines frequently alter their policies. Bags can be a maximum size of 90cm x 75cm x 43cm. This includes the wheels, handles and anything else that protrudes. How many bags you are allowed and how much they can weigh depends on your booking class. Travelling to/from Brazil: Economy and premium economy class young adults and adults flying to or from Brazil can take two pieces of luggage weighing up to 32 kg each. Economy class young adults and adults travelling to and from Ghana, Kenya, Liberia, Nigeria and Sierra Leone or connecting between India and USA/Bermuda/Canada can take 2 bags weighing up to 23 kg each. Gold/oneworld Emerald status flyers get an additional bag on their booking class allowance and the weight restriction on all checked bags will be 32kg. Silver/oneworld Sapphire status Economy flyers are allowed a second free checked bag and and the weight restriction on all checked bags for all classes will be 32kg. If you make one booking on seperate classes, the more generous allowance will apply to the whole journey. 20 June 2017. British Airways cabin crew will again embark on a two-week strike from the 1st until the 16th of July 2017. Crew belonging to the Unite Union will take action due to the dispute over pay and benefits. The strike is also in part a protest to action taken against 1400 crew members who have faced sanctions due to participation in previous strike action. This is expected to affect international BA flights, including the possibility of flights between SA and London. British Airways Comair flights are not affected. 15 March 2017. British Airways will no longer be accepting cash payments at international airports in the USA and UK. This includes payments for additional baggage, flights changes and any applicable service fees among others. Only cards will be accepted from the 1st of April 2017. 28 October 2016. The minimum check-in time for long-haul British Airways fligts departing London Heathrow will be one hour (60 minutes) before departure from the 30th of October 2016. 22 August 2016. British Airways are reducing their inflight catering and will now only be offering one full meal on certain long-haul flights less than 8 hours long. This should not affect flights between South Africa and London which are longer than 8 hours. This is part of BA's plan to reduce waste. 26 May 2016. British Airways are increasing their flights to Cape Town for January and February 2017. The airline will add an additional flight, bringing the total to 16 weekly flights, from the 1st to the 9th of January and the 3rd to the 27th of February 2017. The additional flight will also be operated on a Boeing 747-400 to meet the increased demand for flights to Cape Town. 18 April 2016. When you think about it, drones don't seem like they can really pose a threat against a big aircraft. But when you consider that they can jam the engines or even break the cockpit glass, the threat becomes all too real. Passengers on a recent British Airways flights from Geneva, Switzerland to London luckily only got away with a few scrapes when a drone crashed into their aircraft at London Heathrow Airport. Drones flying dangerously close to aircraft are becoming a frequent occurence in the US. It is illegal to fly a drone in certain areas, especially those where the air traffic is very dense. 30 Sep 2015. British Airways today announced that due to seasonality they will cut back on some Cape Town - London flights. 22 Jun 2015. In what can only be described as a very unfortunate event, two stowaways got onto a British Airways plane in Johannesburg, South Africa and undertook the 11 hour flight to Britain. Miraculously both managed to cling on the plane until they reached London, when one of them lost his life when he fell onto the roof of a shopping centre. The other stowaway managed to cling on and was later discovered by airport staff in a critical condition. It is still unclear how they managed to survive the lack of oxygen and temperatures of minus 50°C, with an investigation still ongoing. They are investigating whether they somehow managed to access the cabin. British police have not yet confirmed the identities or nationalities of the stowaways. If the surviving stowaway regains consciousness, he might be able to provide further clarity. ACSA has also announced that they are increasing airport security. 15 April 2015. British Airways is currently the only airline offering direct flights from Cape Town to London. Virgin Atlantic will no longer operate flights out of Cape Town and SAA stopped operating Cape Town - London flights quite a while ago. 26 Oct 2014. It was announced on the 12th November 2013, that BA would be increasing its Airbus A380 flights from Johannesburg to London to a daily operation. On 22 September 2013 BA flights to Chengdu in China were launched; joining Beijing (launched 1980), Hong Kong & Shanghai (launched 2005) as the 4 cities in China BA flies to. 31 July 2013. Springbok rugby player Bryan Habana races the British Airways A380 (the plane which is being used on the route from February 2014). This follows his race against a cheetah. He starts off well in front, cheered on by Jean de Villiers, but the A380 catches up, before Habana wins by a small margin. British Airways are introducing the A380 on the Johannesburg to London Heathrow flight route from 12 February 2014 (3 times a week), and then increasing the frequency to 6 a week from 10 March 2014. As a result from the 3rd March 2014 they're decreasing their flight frequency from 17 to 14 flights a week. The British Airways frequent traveller programme is called the Executive Club. Only Executive Club members can earn miles on British Airways flights. The same program applies to British Aiways PLC (international flights) and British Aiways Comair flights (domestic flights). Miles earned on one of the airlines can be redeemed on the other. Find out about Lifetime Gold Membership and how to enroll in the programme here. On 747s First, business (Club World) & economy plus (World Traveller Plus) seats have power points. Economy class (World Traveller) don't have power points. On 777s there are power points in first class, business class premium economy and even in economy on some planes. Here's what first class is like on the BA A380, which flies between Johannesburg and London Heathrow.